Dobermans! Lots and lots of Dobermans. Add in several German Shepherds, a couple of Giant Schnauzers, some cow dogs of various abilities and one very special Miniature Schnauzer and you have the makings for a wonderful dog memoir that will have all animal lovers glued to the pages. 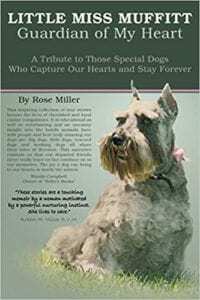 Rose Miller, who has already authored two animal books about her other favorite four-legged friends (mules and Tennessee Walking Horses), pours all her energy and love into this memoir about the dogs who have shared their hearts with her. After giving the reader a brief overview of her early life so that we can understand her underlying love of dogs, Miller jumps right into her story by recounting her early attempts at dog ownership. One of her first dogs was Thunder, a Collie/German Shepherd cross who was trained by Miller to help bring in their farm’s cows at milking time. While Thunder loved running cows, this was a major ‘no-no’ for farmers who needed their dairy herds to be kept calm so as not to ‘drop their milk.’ Thunder’s boundless energy also came to blows with the farm’s pet peacock Peep. Miller found herself finding a more suitable home for her dog and then began a search for a new dog. She settled on an Australian Blue Heeler, a breed known for their cow sense. Unfortunately, Heather, the new dog, needed to be kept busy all the time and her high energy level was getting her into trouble. Heather soon found herself at a new home with a rancher who knew just how to put all that pent-up energy to use. Finding herself once again without a dog, Miller knew she had to carefully select an animal of just the right breed and temperament to fit into her farm’s lifestyle. Dobermans were recommended to her by a horse friend and after researching the breed, she began to look for the perfect dog. Miller's search led her to Falcon, a young male who easily settled in at the Millers' home. This handsome dog was soon joined by Quazar, a beautiful female Dobie. So begins the author’s love affair with this noble breed. We meet the star of the book, Muffitt, several chapters into the story. At the time, Miller was looking for another Doberman to replace one who had just passed, but was disappointed to find no ads from local breeders for Doberman puppies. There was, however, an ad for a litter of Miniature Schnauzer puppies that grabbed her curiosity. Soon a little opinionated bundle of love named Muffitt entered Miller’s life and stole her heart forever. The bulk of Little Miss Muffitt centers around the exploits of the title character, who, along with other canine friends, helps run the farm. We also meet several German Shepherds through the author’s daughter Michal, who is a K9 police officer. Several of the author’s family members make frequent appearances with their canine companions (I have to say Miller has the MOST understanding husband!). Along with the laughter and joy, the reader will share the author’s sorrow when it’s time for an elderly or ill dog to gently pass into the next life. Having previously enjoyed the author’s book The Horse That Wouldn't Trot, I knew I was already a fan of her easy-going writing style. Little Miss Muffitt has that same comfortable, fun style that resembles one friend telling another about her pets. The distinct personalities of each dog comes through loud and clear in this book, which makes it all the more enjoyable. In addition, Miller isn’t shy about discussing her initial failures at selecting dogs and these pages can certainly help a new dog owner choose their first pet. She also shares how she learned to select just the right puppies and stories about police dogs who risk their lives every day. At 234 pages, it’s not a fast read lengthwise, but I nonetheless found it a quick read as I truly enjoyed reading about Muffitt and her friends. Thanks too, Ms. Miller, for donating the proceeds from your books to animal support groups! Quill says: If you have ever shared your heart with a special canine friend, you will surely enjoy Little Miss Muffitt.